The pie charts provide data regarding the way that university students and workers commute to one university in years 2004 and 2009. Overall, the main method of transportation changed over the 5-year period, whereas the least used ways of commute remained the same. What stands out from the chart is that the percentage of car utilization decreased nearly by half from 2004 to 2009. In contrast, the trend for the figures of people traveling by bus experienced a reversed trend, namely the proportion rose from 33 per cent to 46 per cent. Although there was a notable growth in the proportion of students and staff who cycle to the university, the figure remained the third highest figure of the diagram. Looking at the values for train commute and walking to the institution, both saw a marginal increase. The former from 3 to 4 per cent, continuing to be the least popular method of transportation, and the latter from 4 to 6 per cent. 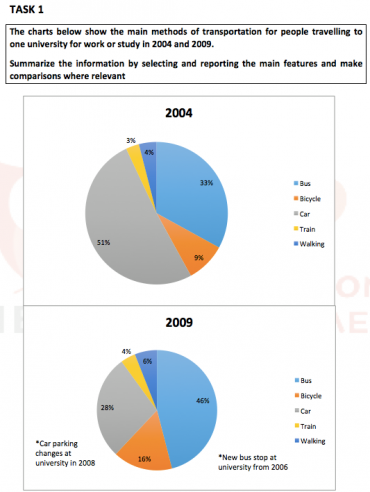 What stands out from the chart is that the percentage of car utilization decreased nearly by half from 2004 to 2009. (from 51% to 28%) In contrast, the trend for the figures of people traveling by bus experienced a reversed trend, namely the proportion rose from 33 per cent to 46 per cent. Although there was a notable growth in the proportion of students and staff who cycle to the university, the figure remained the third highest figure of the diagram.